Update 10: 53 pm ET: Did the Orlando terrorist case other gay nightclubs in the area? Update 10:17 pm ET: Witness says the terrorist mentioned that he was the “fourth shooter” and there was a female who had a “bombing best.” Witness says terrorist claimed there were snipers who were ready to shoot at the cops who would be on the scene. He also says the terrorist said U.S. needs to “stop bombing ISIS” and also, after asking people their race, said he didn’t have “an issue with the blacks.” Witness says he played dead for three hours in order to survive.
.@AmbJohnBolton on @POTUS not saying radical Islam: "It's not a question of magic words [but] of understanding what lies behind this attack"
CAIR offers its condolences and focuses on the “marginalization” and “liberation” of groups that face discrimination. The ex-wife of the Orlando terrorist says he was “mentally unstable” and abused her. She says she worried about her safety around him. On the day of the worst mass shooting in U.S. history, Ken Burns rips into Trump for being an “anti-immigrant know-nothing” during his Stanford commencement address. Orlando is thousands of miles from Israel, but the tragedy there has deeply saddened me. We Israelis feel your pain as if it were our own. It was Latin Night at the club where the terror victims were massacred. Officials have started removing bodies from inside an Orlando nightclub where 50 people were shot and killed. Sunday night, workers brought four bodies on stretchers out of club Pulse and loaded them into white vans. The action was repeated over and over. The bodies were then taken to the Orange County Medical Examiner’s office. Authorities say Omar Mateen opened fire at the nightclub, killing 50 people and wounding more than 50 others before he was gunned down by police. Update 6:43 pm ET: Seven names now. Update 6:25 pm ET: Profile of one young man among the named victims. An eyewitness says Stanley Almodovar III pushed others out of the way before he was shot three times. Caution tape barricades the outside of the hospital where many of the wounded are being treated. 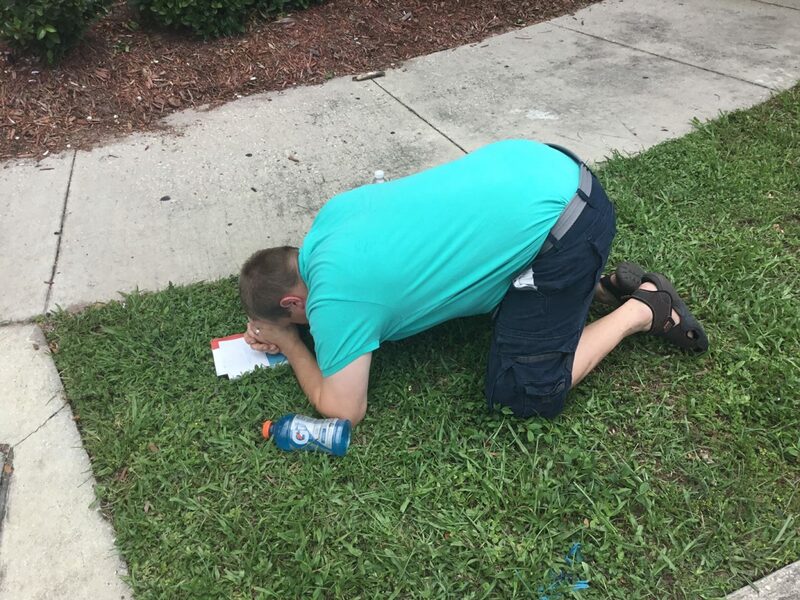 This man was sobbing and praying loudly. The green tent in the distance was possibly being used as a temporary morgue. Update 5:54 pm ET: Facebook purging Wrong Opinions. Update 5:22 pm ET: Two more victims named. Update 5:18 pm ET: White House releases photo of Obama. Update 5:08 pm ET: Strong statement from Sen. Ted Cruz. For all the Democrats who are loud champions of the gay and lesbian community whenever there is a culture battle waging, now is the opportunity to speak out against an ideology that calls for the murder of gays and lesbians. Update 4:58 pm ET: Trump in his statement and latest tweet reaffirms he will continue stressing a ban on Muslim immigration. Several left-wing reporters are snarking that Mateen was born in the U.S., but Trump’s official statement makes it clear he is referencing Mateen’s father. Update 4:25 pm ET: Arabic Twitter accounts react gleefully. Update 4:25 pm ET: Local news names the mosque that Mateen attended. Update 4:15 pm ET: Timeline from the Orlando Sentinel. Mateen had three hours to kill as many people as he could inside the club before police went in. Update 3:47 pm ET: Wolf Blitzer asks Karzai whether he considers Afghanistan a “failed state.” Karzai denies. Update 3:42 pm ET: CNN has former Afghanistan president Hamid Karzai in studio right now. Update 3:39 pm ET: Shot. It will be pathetic if this fall we have a choice only between politically correct progressivism and know-nothing authoritarianism. It’s no secret that abroad men who are gay — and merely suspected of being gay — are targeted for execution; today, that threat has reached the United States. Log Cabin Republicans extends our deepest sympathy, condolences, and sorrow to the victims and families of those targeted in this morning’s violence. If the shooter’s suspected motivations are indeed confirmed, we call upon President Obama and the presumptive nominees of both parties to condemn the attacker and acknowledge in no uncertain terms the cause of this massacre: Radical Islamic terrorism. 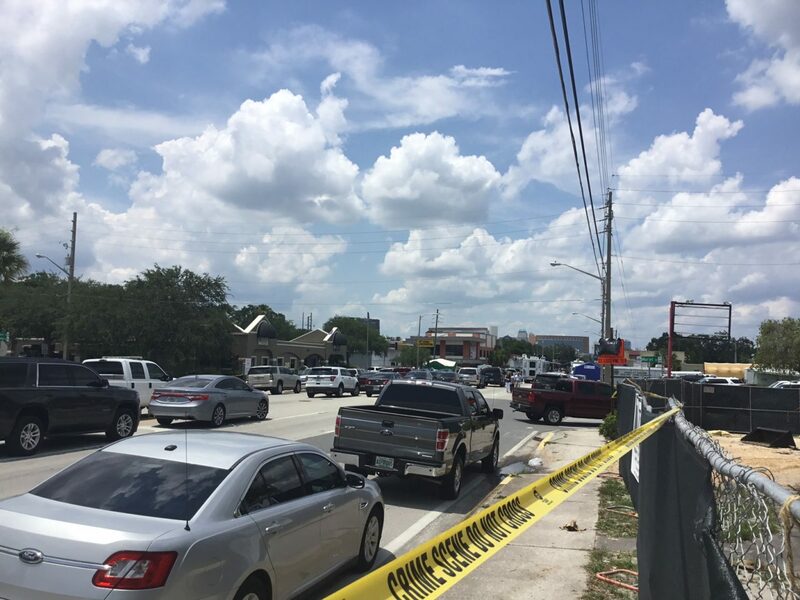 Update 3:20 pm ET: ATF spokesman said Mateen bought two weapons in recent days/weeks, a handgun and a long gun. Representative from @ATFHQ says at press conference that #Orlando shooter legally purchased a handgun and "long gun" within the last week. Another woman, Aixa, who also spoke to Breitbart News and also did not want her identity revealed or to be filmed on camera, said she just moved out of New York City to escape violence and crime, and just narrowly missed the shooting. “We literally just missed the attack.” Cop cars began speeding past, and Aixa, the designated driver for the night, drove carefully as they rushed to the club. Aixa took her friend to her house to let her get ready for work, dropped her off at her job, and came home to her partner. Moment of silence at 6 pm tonight for victims of Pulse shooting. Update 3:07 pm ET: No mention of Islam in statement from Hillary Clinton campaign. Update 3:05 pm ET: Orlando officials say their current press conference will be their last for the day. Update 2:54 pm ET: New York Times reporter sheds light on Mateen’s pledge of allegiance to the Islamic State: instructions from spokesman Abu Mohammad al-Adnani. Update 2:49 pm ET: Marco Rubio says the killer had a “warped ideology.” “Islamic terrorists need to know that they will not win,” he continues. Update 2:46 pm ET: Via Warner Todd Huston: Mateen worked for the security firm G4S since 2007. Update 2:32 pm ET: The Islamic State has claimed credit for Mateen’s massacre. 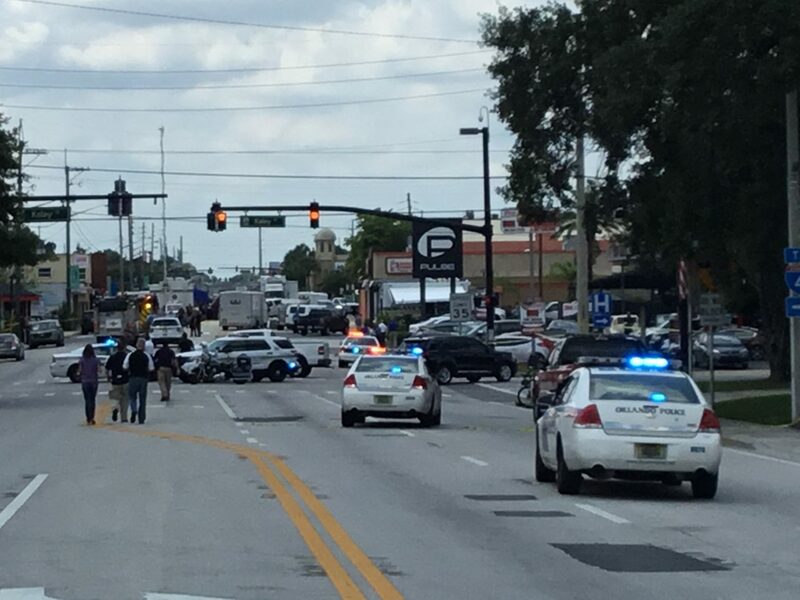 Source to #AmaqAgency: The attack that targeted a nightclub for homosexuals in #Orlando, #Florida and that left more than 100 dead and wounded was carried out by an Islamic State fighter. Update 2:22 pm ET: From Katie McHugh. 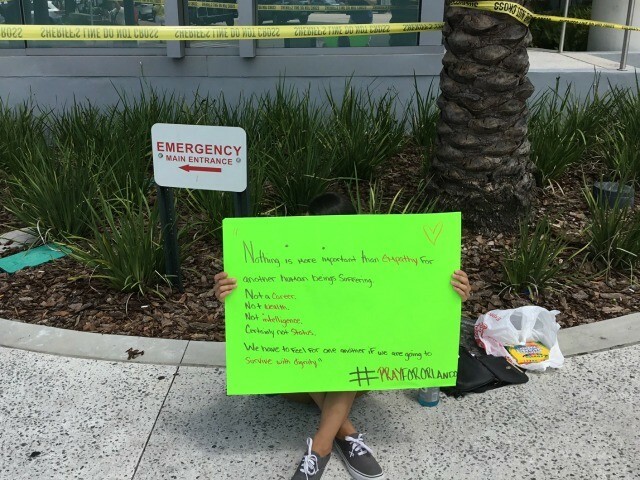 Elizabeth, a woman who was in the night club and spoke with Breitbart News but asked that her identity not be revealed, left Pulse at 1:45 am Sunday night, just as gunshots rang out. “I don’t really have family, I just have friends, and I don’t know what friends are living or dead, and it’s so terrible,” she said. “So we just drove out and rolled out, and within two or three minutes there were cops coming everywhere. I didn’t know if it was an accident, or the gunshots I heard… So I just went home and went to sleep, and now I see all the news, and the Facebook, and all of my friends,” she said, adding that she was getting frantic calls asking if she was safe. “It was scary. I was scared,” she said. One user reported that he was banned from the /r/News subreddit after he posted a link to a news story detailing the FBI’s suspicions that the Muslim shooter, who attacked a gay nightclub in Orlando, had ties to Islamic extremism. Update 2:05 pm ET: Obama does not take questions from the press. 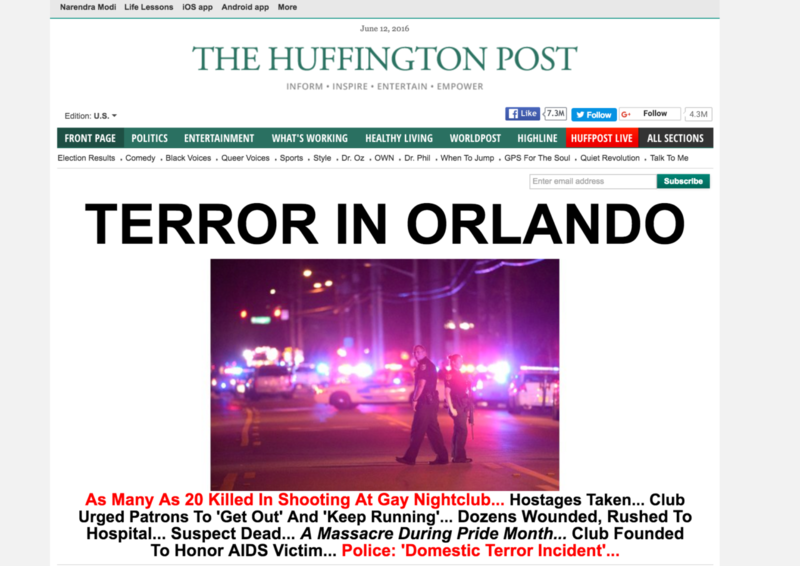 Update 2:01 pm ET: Obama says this is even more heartbreaking in light of the killer’s targeting of LGBT victims. 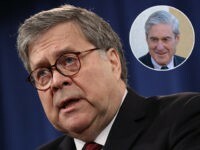 Says that it is an attack on all Americans. Update 1:53 pm ET: Horrific. Update 1:42 pm ET: L.A. mayor Eric Garcetti says the city believes the arrest last night is “completely unrelated” to the Orlando massacre. Update 1:38 pm ET: A man has been arrested heading to the Los Angeles Pride Festival with an arsenal of weapons, according to breaking news reports. Update 1:35 pm ET: Mateen’s father is on video praising the Taliban. 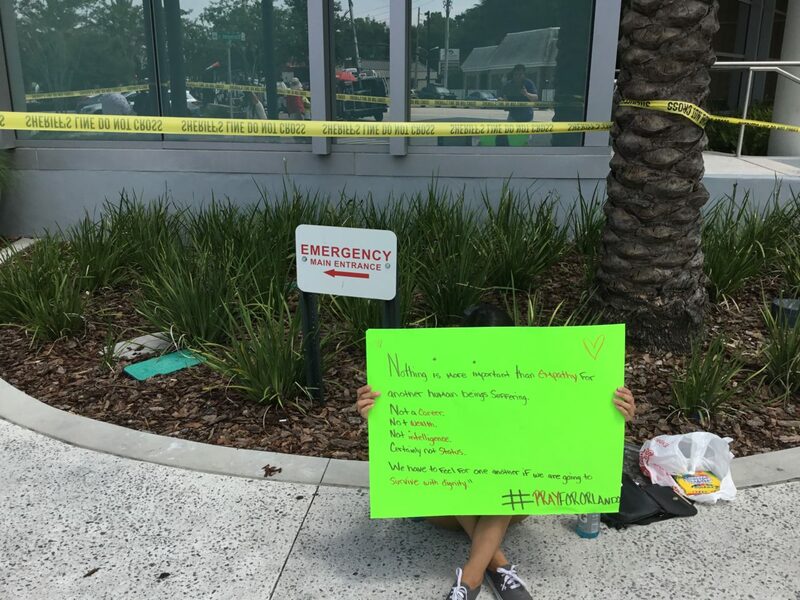 The ex-wife of the 29-year-old man suspected of killing 50 people in a Orlando nightclub early Sunday said that he was violent and mentally unstable and beat her repeatedly while they were married. The ex-wife said she met Omar Mateen online about eight years ago and decided to move to Florida and marry him. At first, the marriage was normal, she said, but then he became abusive. Florida Gov. Rick Scott said during a press conference Sunday morning the shooting was “clearly an act of terror” and that he had declared a State of Emergency for Orange County. Mateen was a ‘known quantity’ to federal law enforcement before he killed 53 people in the worst mass shooting in U.S. history. 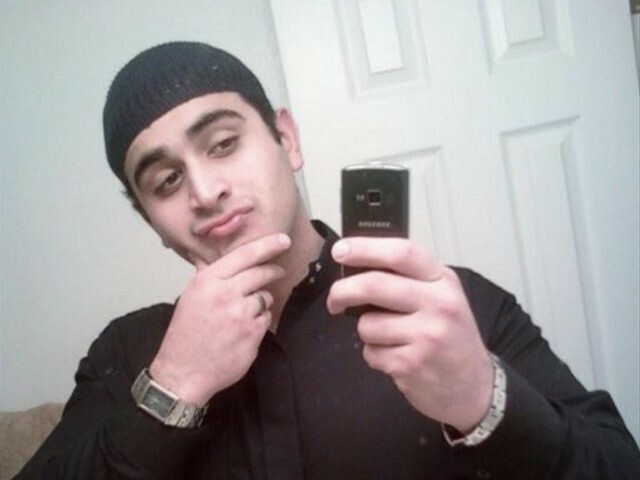 Omar Mateen of Port Saint Lucie, Florida, came to the attention of federal authorities twice prior to being identified as the gunman in the Orlando nightclub mass shooting, a senior law enforcement source told The Daily Beast. The senior law enforcement source reports that Mateen became a person of interest in 2013 and again in 2014. The Federal Bureau of Investigation at one point opened an investigation into Mateen but subsequently closed the case when it produced nothing that appeared to warrant further investigation. The NBC News report also notes that approximately 320 people were in club when the shooting began. Update 11:18 am ET: Hot takes begin. EVERY religion has sub-groups of intolerant extremism. You can’t tell me the problem is religion. The problem is intolerant extremism! More from Badolato: Many of those brought into area hospitals, local reports say, were in grave critical condition. Hospitals are preparing for intensive trauma surgeries. In addition, local eyewitnesses reported seeing police officers doing chest compressions on victims in the back of pickup trucks. ORLANDO, Fla — Breitbart News’ Andy Badolato, reporting from the scene, says the local police have swept the night club for bombs. They have not, however, removed any of the at least 50 dead bodies yet. At least 53 people were also taken to local hospitals putting, the victim count at at least 103 total. The status of those taken to area hospitals is unclear. NBC’s Pete Williams reports that terrorist was on a “watch list” over associations w “suspicious” ppl several yrs ago. BREAKING: Mayor: 50 casualties, including shooter, and 53 hospitalized in mass shooting at Orlando nightclub. Orlando recently wrapped up its annual weeklong Gay Days festival on June 6 in which up to 150,000 in the LGBT community attend area theme parks, gay nightclubs and special events. It was the 25th anniversary of Gay Days. It is one of the largest gay pride events in the world. 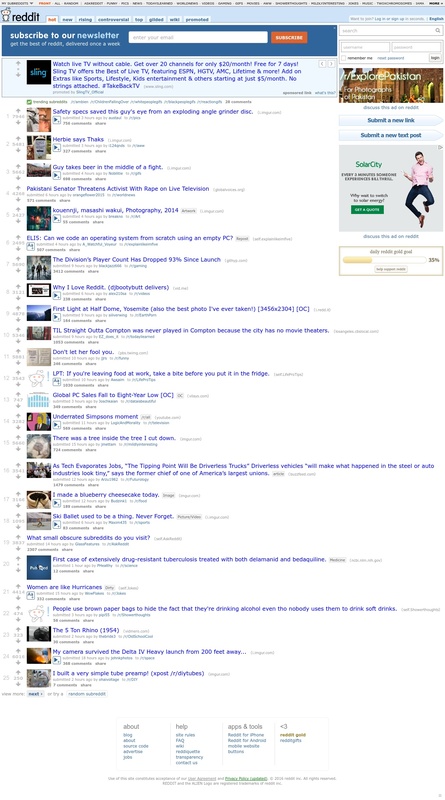 And it’s not stopping as we see apparently today. More of these attacks are coming. It’s a real part of the threat that we face and if we can’t address it openly and directly, and say directly that there is an extremist element within Islam, that’s dangerous to the world and has to be confronted. Meanwhile, #GunControlNow is trending on twitter. Update 9:50 am ET: Blood donors needed. CBS reports he is a U.S. citizen born to Afghan parents. CBS also notes that there may have been multiple explosive devices that did not detonate. That’s when authorities say Omar Mateen emerged, carrying an AR-15 and spraying the helpless crowd with bullets. Witnesses said he fired relentlessly – 20 rounds, 40, then 50 and more. In such tight quarters, the bullets could hardly miss. He shot at police. He took hostages. When the gunfire finally stopped, 50 people were dead and dozens critically wounded in the deadliest mass shooting in modern U.S. history. Mateen, who authorities said had pledged allegiance to Islamic State in a 911 call shortly before the attack, died in a gun battle with SWAT team members. Authorities immediately began investigating whether the assault was an act of terrorism and probing the background of Mateen, a 29-year-old American citizen from Fort Pierce, Florida, who had worked as a security guard. The gunman’s father recalled that his son recently got angry when he saw two men kissing in Miami and said that might be related to the assault. Pulse patron Eddie Justice texted his mother, Mina: “Mommy I love you. In club they shooting.” About 30 minutes later, hiding in a bathroom, he texted her: “He’s coming. I’m gonna die.” As Sunday wore on, she awaited word on his fate. Mateen exchanged gunfire with 14 police officers at the club, and took hostages at one point. In addition to the assault rifle, the shooter also had a handgun and some sort of “suspicious device,” the police chief said. About 5 a.m., authorities sent in a SWAT team to rescue the remaining club-goers, Police Chief John Mina said.